Welcome to my 5th Disney Trip Report! I decided name this trip report WDW-40: 2016, because we were on holiday celebrating my 40th birthday! You can read all about the planning of this trip, and learn more about who we are in my Pre-Trip Planning Report here. This is the Index for all of the days of this trip report – we went for a month, so there are a LOT of days to write about! It may also take me a while to get this trip report written, but I ALWAYS finish what I start when it comes to my Disney Trip Reports. Bookmark this page so that you know where to find it to catch up with the latest report, or better still, join The Disney Trippers to get the reports direct to your inbox! Me – Michelle, 39 years old, but of course turning 40 when we are at Walt Disney World! 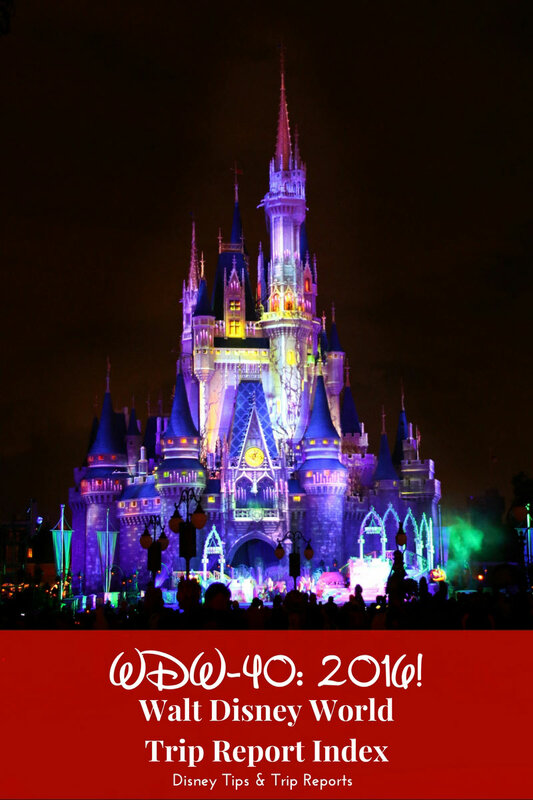 I am the planner, photographer, trip report writer, and driver for our holidays to Walt Disney World and Orlando. I’m a plus-size woman, and this year I am still around a size 30/32. I’ve been to WDW at all sizes from a 24 to 32, so for all your plus size worries, I’m your gal. Him – my husband Steve, 43 years old. He’s the pack horse, videographer, chief keeper of documents, and money manager when on hols. He keeps a track of everything dollar that we spend! He also loves to eat! I’m not sure where he puts it, but he knows his way around a Disney buffet! My trip reports are photo heavy! I often include single images, or smaller galleries – either way, pages may take a little longer to load depending on your internet connection speed. You can click on gallery images to enlarge them. You will also be able to find all of the images from WDW-40 in my Flickr Collection of albums from this trip. I start at Day 0 – I always have for my trip reports! This is because it’s the day before we fly, and not really part of the holiday (although, it kinda is!) This report ends on Day 30 – the links below will become active as I write each day. Allow up to a year (yes, seriously!) for me to get this finished!! If I can get it written sooner, then of course, I will! Disclosure: The links below are Amazon Affiliate Links. If you clicked on a link and made a purchase, I would earn a commission from the sale. It doesn’t cost you any extra, but affiliate income helps me to keep producing content on this blog. Thank you. The camera I used for the first time in Orlando: Canon EOS 70D. The two main lenses I used: Sigma 18-300mm F3.5-6.3 DC Macro and Sigma 30mm F1.4 DC Art. I also took a Canon EF-S 10-18mm f4.5-5.6 IS STM Wide Angle Lens but I didn’t it use much. I also take some photos on my iPhone6 for sharing on social media – follow DTTR on Instagram. Waterpark photos are taken with: Panasonic Lumix DMC-FT5. Videos are taken with Panasonic HC-V720, although the newer model is the Panasonic HC-V770. Any photo editing is done with Paint Shop Pro X8, Photoshop CS5 or the Camera+ iPhone app.